Lock in a great price for Scandic Holmenkollen Park – rated 8.2 by recent guests! The view of Oslo by day and by night. The breakfast was nice with plenty of options. The breakfast buffet was excellent! The view from our room was lovely. Breakfast was outstanding. Beds were very comfortable. Amazing location with a fantastic view! Excellent breakfast buffet and really good gym facilities. Bed and room was very comfortable. I liked the little balcony and big windows. Staff, check out until 12 o'clock, view from the hotel, free upgrade to junior suite. Great location with excellent view and city and close to the ski jump. Excellent breakfast. View is outstanding on top of a mountain. First class hotel. Casual attire is acceptable. Scandic Holmenkollen Park This rating is a reflection of how the property compares to the industry standard when it comes to price, facilities and services available. It's based on a self-evaluation by the property. Use this rating to help choose your stay! Dating back to 1894, this traditional hillside hotel is just a 5-minute walk from Holmenkollen Ski Jump Tower. Guests enjoy free access to the spa facilities and panoramic views over Oslo from the lobby. Holmenkollen metro station is a 15-minute walk away. Each room has a flat-screen TV and private bathroom with shower and free toiletries. Free WiFi is available. The renowned De Fem Stuer Restaurant offers dining in a unique and historic setting. Casual bistro dining is offered at Scandic's Park Cafe. Drinks can be enjoyed by the fireplace in the bar. Additional facilities at Scandic Holmenkollen Park in a fitness room and bicycles rentals. The surrounding Nordmarka area is ideal for nature walks, skiing and hiking. Oslo city center is 20-minutes away by metro. When would you like to stay at Scandic Holmenkollen Park? Features a flat-screen TV with cable channels and a private bathroom with shower. Public parking is available on site (reservation is not possible) and costs NOK 150 per day. These spacious rooms include a flat-screen TV and fridge. This double room features a TV with cable channels. This double room features a desk, fridge and flat-screen TV. This double room features cable TV, desk and fridge. Featuring a view of the city or Oslo Fjord, this double room also provides a flat-screen TV and fridge. 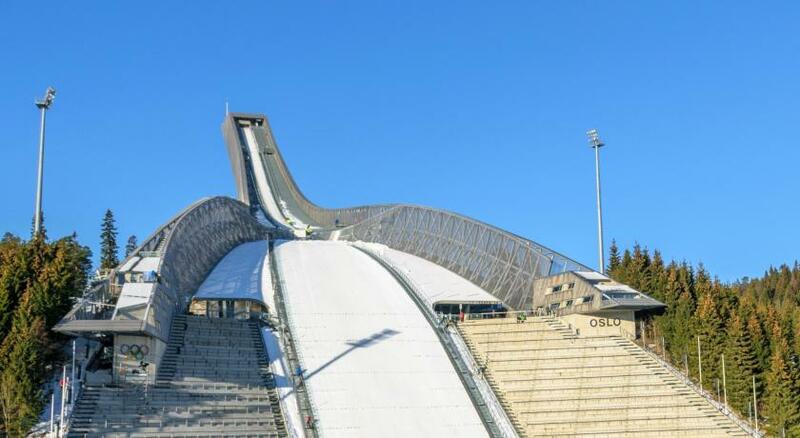 Welcome to the Scandic Holmenkollen Park . Perched high above the city like a palace out of a Norwegian fairy-tale, it offers stunning views over the city and the surrounding landscape. A magical place for a family holiday, and a unique conference venue, the hotel is just 15 minutes’ drive from Oslo city center. The oldest part of the hotel dates from 1894 and is timber-built in the ‘dragon’ style of the mediaeval Norwegian ‘stave’ churches . Here you will find our first-class restaurant «De Fem Stuer», as well as comfortable lounges and a range of banqueting and conference rooms, all named after famous Norwegians. Our well-equipped conference hall hosts up to 750 delegates, and the hotel also offers modern SPA facilities, a well-equipped gym and an indoor swimming pool. With 336 hotel rooms and suites, the hotel will accommodate modern comfort in a mountain fresh design. Located close to the Holmenkollen Ski Stadium and Ski Museum and with direct access to wonderful skiing, walking and cycling country, the hotel offers superb opportunities for recreation and relaxation in the heart of nature, yet close to the city. House Rules Scandic Holmenkollen Park takes special requests – add in the next step! Scandic Holmenkollen Park accepts these cards and reserves the right to temporarily hold an amount prior to arrival. It would have been nice to have moisturiser in the bathroom. There was very little information in the room itself about the surrounding area or the history of the hotel. The bar was incredibly expensive! We wanted to check out the ski jump museum and have a view over Oslo. We stayed in the new part of the hotel. The hotel itself is a little odd looking (Chinese - European fusion), but is very nice. The room rate for the evening was really good (for Oslo). Beds were comfortable. Hot water and good breakfast. Nice and quiet and a good location. Very spacious room. Friendly staff. Good dog walking in the area around the hotel. Food, hopeless wifi, disorganized staff. Location is great and nice view over Oslo, but the hotel disappointed, small basic room, untidy lobby/bar and poor food in bar/café in Lobby. I know the hotel before it became part of the Scandic chain and had good memories, now not the same any more. Expensive to take taxi to/from central Oslo. Lovely clean room in gorgeous hotel. Ideal location. Breakfast was delicious and so was the food at the restaurant! Clothes storage not great and no safe. Bathrooms a bit dated but clean and shower very good. Breakfast fab. Location great, 20mins up hill from Oslo on train - we loved looking out across the harbour, beautiful and 5mins walk or so from train station. Was approx 380NOK for journey one way to town. and was only 20mins. Very pleasant service, regular and locals use it to get to cross country ski areas. Some people would prefer being central to Oslo centre but train takes you right there and we enjoyed escaping up the hill each night after long day sightseeing. Room os not cleaned properly. Deteriorated furniture; missing parts, broken accessories, abd very noisy bed. I had an experience with a very unprofessional receptionist, claimed to management about him, and they did not respond till now. In addition to the professionalism issue, he withdraw more money from my credit card without my permission. I asked why did you withdraw, he said I don’t know what was i thinking!!! No information provided during check-in, i had to ask very specific questions to get an answer, and some question (nearest ski center) they claimed lack of knowledge, while i found what i asked for just outside the property. Breakfast is good, they do serve good variations of food and desserts. Housekeeping left soap in shower infilled. I had my own. It's not easy to reach here with public transportation (tram), as there is a 10-min steep uphill walk which could be a nightmare with your luggage. Also, I was here for a conference and on-site restaurants were always full (10 or more people waiting in the line), and the food was limited to several options in the menu. This should be improved. An iconic hotel at a remote location (considering Oslo city center). However, you could catch amazing views over Oslo. One of the best breakfasts I ever had was here. Hotel is nice, spa is lovely but small. The hotel staff are fine and there was a lady at the bar with glasses and dark hair who was very lovely and helpful. Great place, location and amazing building.